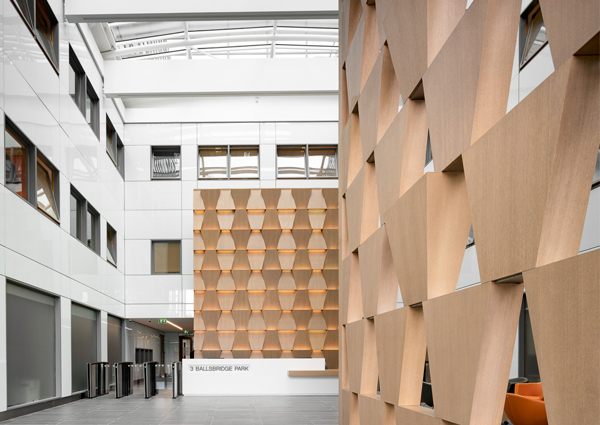 Studio 3 carried out the refurbishment of this 6-story office building, which comprised upgrading of lift lobbies and stairways, re-configuring and refurbishment of a dated atrium entrance area and re-fitting of all toilets. It also involved works to three floors of open plan offices. The upgrading of the reception area included the introduction of a new reception desk backed by a double height feature wall. White glass panels replaced the original, out-dated timber panels. A meeting room was designed into an unused undercroft space. These new elements combined to utilise, brighten and modernize the atrium space.